Six weeks ago, I took out your old photos taken on the morning of 26 June 2009. 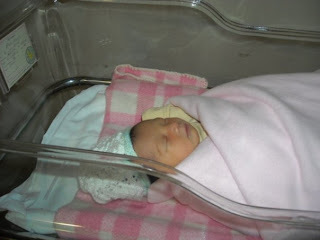 Looking at these pictures, I ended up reminiscing the moments we spent at the hospital, minutes after you were born. What I remember most was watching you sleep on my chest with your belly against me, looking so tiny and adorably fragile. I was so in awe of you. That was 25 months and 12 days ago. It's crazy how time flies huh? Anyway, shortly after your birthday, I discovered that “The Terrible Twos” theory doesn't exist. I have braced myself for the horror to happen but it never did. Instead of turning into one of those scary toddlers in Super Nanny, you have continued to behave like an angel. You don't throw tantrums or yell or run amok in shopping malls. Alden does all that. From the day you were born, you've always been a perfect baby who does everything by the book. You turned over at 6 months, crawled at 8 months and started walking when you turned 1. Your best achievement so far is your speech. You started saying words like Mama, Dada, Yes, No, Car, There, Nenen and many more at 11 months. Now at two, your vocabulary size has multiplied. Apart from answering questions and voicing out your thoughts, you can easily carry out a simple conversation. This one transpired a few weeks ago when the two of us were spending time together. Mummy: Ok la..ok la...mummy put-put. Hehehe. Alva: You naughty girl! Say kius me mummy! Say kius me! Too bad Alden wasn't there to take the blame. You know, whenever we go out together, people would ask me how old you are and whether you could talk. I like this a lot cos I get the chance to show people what an awesome baby you are. Unfortunately, you never help me on this. It is as though you resent the idea of mummy showing off. You never respond to questions and you're always silent when I ask you to talk. Why Alva? Why?? Do you know that because of your silence, no one ever believes me? We should really work on your PR skills. Talking about skills, I noticed that you have a keen interest in drawing. Everyday, you'd sit for at least 30 minutes to sketch on your doodling board. Objects you enjoy sketching include grapes, banana, spiders, apples and circles. You have actually drawn heaps of stuff but those are the only ones I recognised. Apart from sketching, your other hobbies include playing with make-up, singing, watching me do the laundry and pretending to read out loud. Your relationship with your brother has also improved. Yes. There are still lots of fights between you two but at the end of the day, you'd kiss and make up. Because you spend most of your time with him, you like to mimic every little thing he does. In fact, you learned most of your new motor skills from him. You know, stuff like table-climbing, pillow-fighting, drumming, hair-pulling and jumping off couch. Thanks to these the hands-on tutorials, you have become more independent and you are now able to defend yourself from Alden. At times, you can even make him cry. Unlike your brother, who is very picky with food, you consume anything I give you. You eat prawns, chicken, beef, noodles, hinava, rice, lamb, pasta, curry etc. There is no limit to what you can eat. Because of your flexibility, I have no trouble feeding you. It's really a blessing cos I don't think I can handle two picky eaters at the same time. You and I share a special bond together. The way you open up to me is amazing and I think your dad is a bit envious of our relationship. You always favour me over him. For e.g. you’d give me kisses without being asked to and you’d continue doing it until I kiss you back. Your dad gets a different treatment. You only kiss him when he begs you to. I know you adore me more than him but try not to be so obvious okay? So. What's my favourite part of the day when it comes to you? It is seeing you wake up in the morning all happy and excited. You'll say Morning mummy!! Yay! Look, sunny day!! Vava want nenen!! When I do give you nenen, you'd smile your biggest smile and give me a warm cuddle. The feeling I get when we cuddle is like eating a mouthful of banana-chocolate cake from Secret Recipe. I get a rush of endorphins in my head and a feeling of euphoria akin to having a retail therapy. It is an awesome, awesome feeling. It is when we cuddle that I see what's important in my life and why I do the things I do. You don't know it yet, but you have the power to bring out the best in me. What else can I say? You are everything I ever wished for in a daughter: Angelic, smart, adorable, bubbly, kind and loving. I am truly blessed to have you. Deb-Ala, mita and andrea are not as cheeky as Alden bah. Alden's cheekiness is out of this world. I think that's why God granted me with a kuai 2nd baby. Hehe. Kalau nda pengsan oh Deb.I miss your little ones too. REally want to see Derek Alver in person. NEXT year k? so sweet :') Happy birthday Alva! wow..so sweet oh si Alva..
regard to ingkung Alex kio.. Thanks Cheall! Will pass the message to hubby. Btw, pangkat ingkung ka dia??? OMG. Jgn saja ko panggil sia nenek la ah...Hahaha. A beautiful letter to an adorable daughter! Enjoy your kids, Lizee! They grow up too fast. Before you know it, you'll have a plastic surgeon in the house!